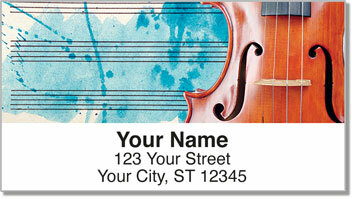 If you're a violinist, these eye-catching return address labels are the perfect finishing touch for all your letters and packages. The violin is like the soprano of the orchestra. 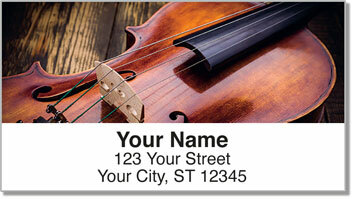 It sings out the beautiful high notes, often carrying the melody of a composition. 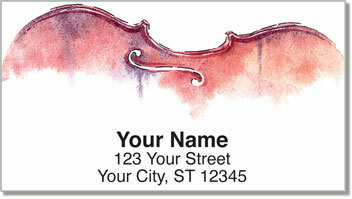 Whether you're a fiddler of folk tunes or a classical music performer, this colorful design celebrates your connection to one of the most beloved and beautifully designed instruments in history. Plus, you'll be pleasantly surprised at how much easier it will become to prepare your outgoing mail. Use these self-adhesive labels to save a ton of time. Just peel and place them on every envelope. 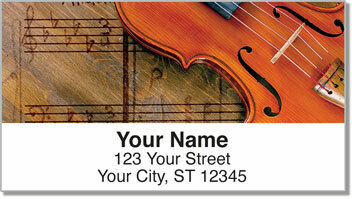 Order your very own Violin Address Labels today! Get them with a matching set of checks.